Andrea Beck and Donald Yap hope to start a family soon, and wonder how their mortgage debt will affect their dream of retiring at 55. 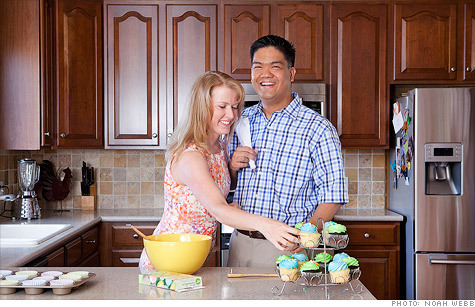 (MONEY Magazine) -- Donald Yap, 33, and Andrea Beck, 34, make pretty good money: a combined $183,000 from her job as a researcher at the University of Colorado, his job at consulting firm Booz Allen Hamilton, plus his service as a major in the Air Force Reserve. Their high salaries have allowed them to amass significant savings ($233,000 in retirement plans alone) and real estate (three properties, including the house in which they live in Highlands Ranch, Colo.). But things are about to change. The couple is getting married in July and would like to start a family right away. "It would be wonderful to be a stay-at-home mom," says Beck. They're concerned, though, that the loss of her pay -- which would bring their income down by about a third -- and the addition of a baby will slow their savings progress. "We'd love to retire at 55, but will children change that?" asks Yap. Adding to their worries: the fact that they're losing a total $645 a month on the rentals of his old house and her old condo. Prepare to be parents. Yap and Beck should budget $12,000 a year for raising a child, says Denver financial planner Karlton Childress. Their current expenses are $5,120 a month, including the rental loss. Even adding in the cost of a baby, Childress figures they should be able to get by on Yap's salary with room to save. Before Beck quits, though, they should build their cash cushion to $90,000 -- more than a year's expenses -- in case he loses his job or they lose a renter. Local Re/Max agent Rick Culp predicts that within five to 10 years, the area should see 7% to 10% appreciation. If raising kids dampens the desire to be landlords, however, Yap and Beck could sell the house and use the equity from it to pay off the condo. Rejigger retirement. While still working, Andrea should hike her retirement savings rate to 10%. Once she quits, Don, whose firm matches 10% of pay, should squeeze to stash the max ($17,000) in his 401(k). These steps -- along with his military pension and proceeds from the property sales -- could allow them to retire by 62. Figuring they'll pay college tuition for two kids, 65 is more realistic.